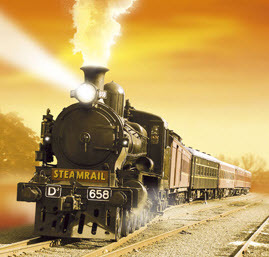 Enjoy a Steam Train Ride with Steamrail Victoria. Travel to Castlemaine and change trains for a day out to Maldon, or alternatively travel with us through to Bendigo. (S) Steam Hauled. (D) Diesel Hauled. Departing Southern Cross station, explore the Goulburn Valley wineries or travel on to Shepparton in Steamrail's heritage carriages behind a classic 1950s R class steam locomotive. Steam train to Echuca. Wine & Dine, paddle boat cruise & dine or explore historic Echuca. Travel from Castlemaine / Bendigo to Echuca by steam train in the luxurious Macedon and Tambo carriages (First Class) or in 1920's vintage carriages (Excursion Class). Join Steamrail Victoria for a 45 minute return journey aboard Melbourne's red rattler Tait trains hauled by two steam locomotives.